This chicken is full of flavors. 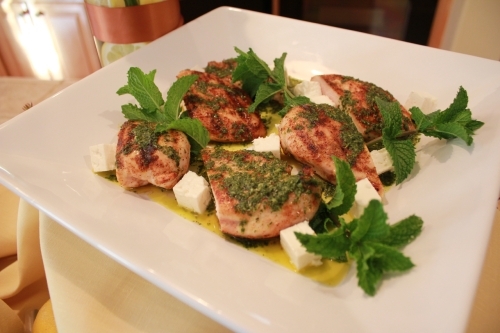 The spiced chicken is cooled down with a mildly sweet and tangy mint dressing and creamy feta. I like to slice the chicken and spread a bit of feta on every bite! In a food processor, pulse garlic until finely minced. Add mint and basil and pulse. Add salt, pepper, lemon juice, and honey and pulse. Slowly pour in olive oil until completely mixed in. Scrape down sides and mix if needed. Pour mixture into a bowl and set aside. Mix paprika, cayenne pepper, cumin, coriander, ground mustard, salt, and pepper in a small bowl. Set aside. Pour 1/3 cup olive oil into a small bowl. Lay chicken breasts side by side and generously brush both sides of all chicken breasts with olive oil. Generously sprinkle spice mixture on both sides of all chicken breasts. Reserve remaining spice mixture for another use. Prepare barbeque grill and set to medium heat. Spray with non-stick cooking spray to prevent sticking. Grill chicken breasts turning often until cooked through about 10-12 minutes. Remove from heat and slice in halves. Place chicken on a platter and spoon with mint dressing. Garnish with cubed feta cheese and serve immediately. Serve remaining dressing on the side.